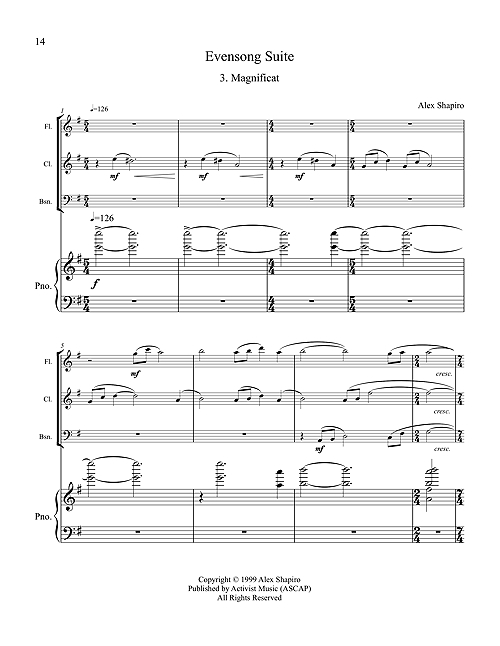 Six movement work: "Prelude," "Phos Hilaron,"
"Magnificat," "Nunc Dimittis," "Ascendit Deus,"
45 pages, 8.5" x 11". Premiered in May 1999 in Los Angeles, CA. for which it was composed. 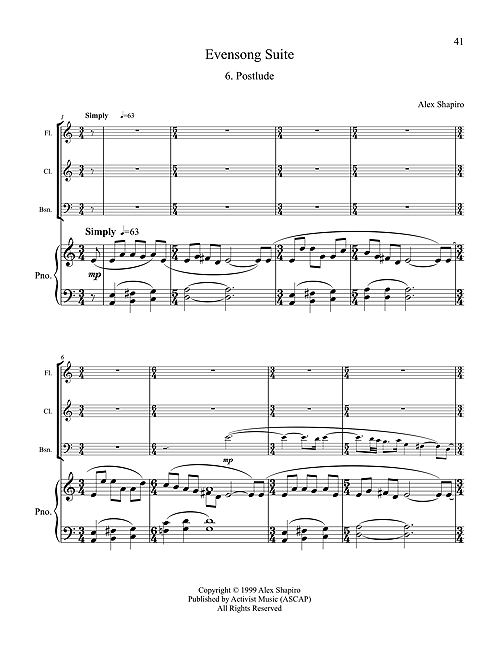 Score and parts of the complete Evensong Suite available from Activist Music for $45.00 print; $32.00 digital. Individual movements are available; email Activist Music. The Evensong Suite was commissioned by St. Bede's Episcopal Church in Mar Vista CA., and it is a modal and very melodic set of six short pieces, each two to three minutes in length. 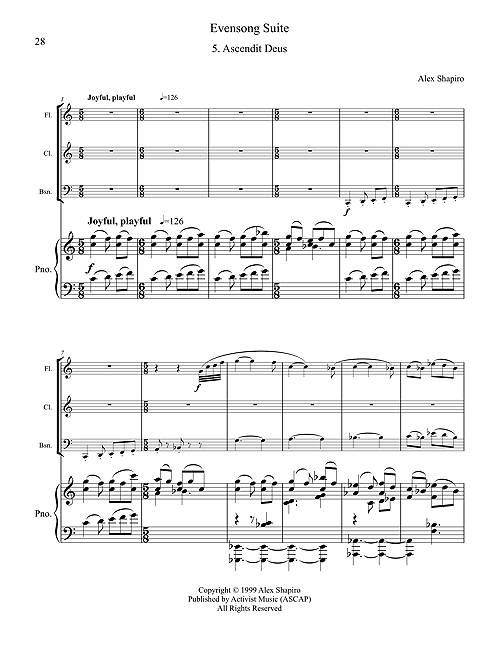 Although it was composed specifically for an Anglican Evensong service, during which each movement precedes or follows a corresponding prayer or reading, the piece is equally effective when performed in a concert setting. Any of the six movements may be performed separately. The Prelude opens the Suite in a pastoral mood, with a rising motive to reflect the Ascensiontide occasion for the piece. The Phos Hilaron evokes a slow and quiet glow, mirroring the beauty of the last vesper light of a setting sun. The Magnificat, traditionally the dramatic center of the Evensong service, uses strong opposing motives which refer to the mighty being cast down from their thrones and the meek being lifted up. Nunc Dimittis is a pensive lullaby which blossoms into contentment and inner light. The Ascendit Deus was written to encourage generous donations during the Offertory for the Sunday after the Ascension (! 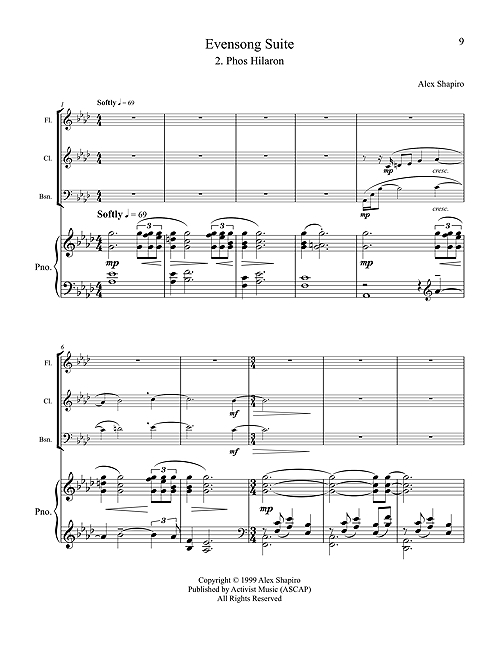 ), and in celebration of the Savior rising up, so do the lines of the music! 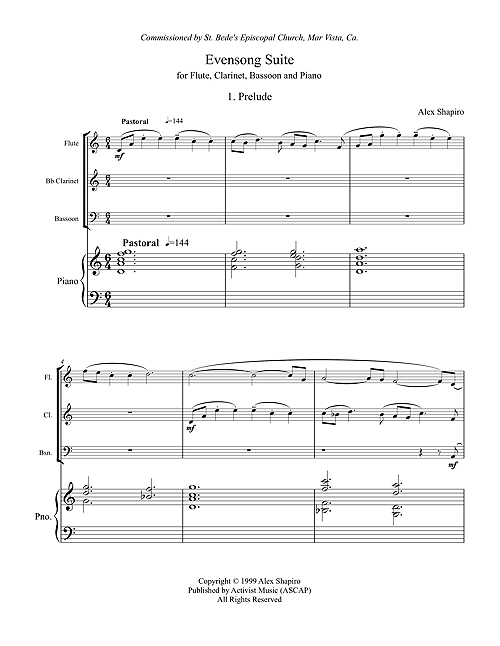 Finally, the Postlude begins with a contemplative and noble chorale and makes references to motives and moods from the earlier Prelude and Magnificat, bringing the Suite to a triumphant conclusion. Phos Hilaron is featured on the 2007 Innova Recordings CD, Notes from the Kelp (innova 683). Click CD for more info. "...[Phos Hilaron] is so subdued in full-frontal music-ness... it's expressed beautifully. " "Phos Hilaron... is a harmonic statement of great purity and simplicity, a circularly drifting cloud of winds and piano." 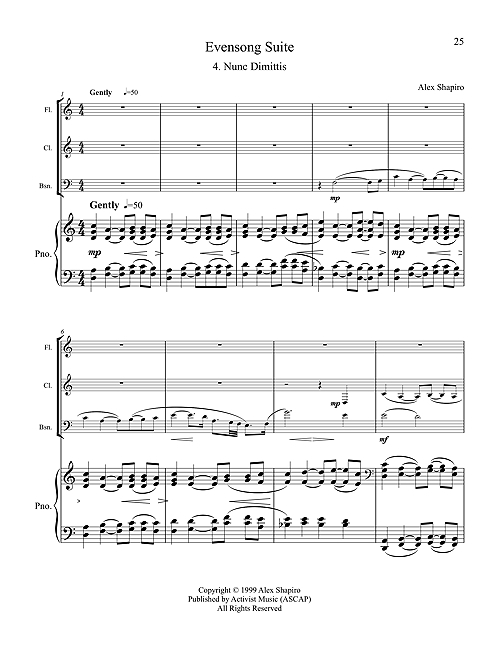 "Phos Hilaron (Gracious Light) is the second movement of Ms. Shapiro’s 1999 six-movement Evensong Suite, and is scored for flute, clarinet, bassoon, and piano. This lovely Anglican liturgical piece celebrates, within its liturgical Evensong service context, “the last vesper light of a setting sun,” as Ms. Shapiro puts it. But as with all the works on this CD, its putative meaning is malleable, and outside of its liturgical setting one should feel perfectly free to assign to it anything whatsoever it might call to mind."